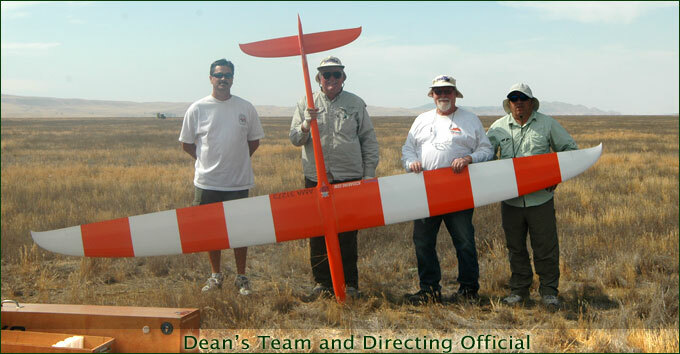 On Friday September 28, 2012, Dean Gradwell and I simultaneously set a new world record for Glider Goal and Return distance. We each flew our own gliders from separate vehicles, breaking the current world record of 39.1 kilometers (24.3 miles) held by Gary Fogel. The location was California Valley, a large sparsely populated valley about 60 kilometers long, located in Central California. We have been holding Cross Country Glider contests there for the last 12 years, so we were very familiar with the terrain and knew it would be an ideal location for the record attempt. 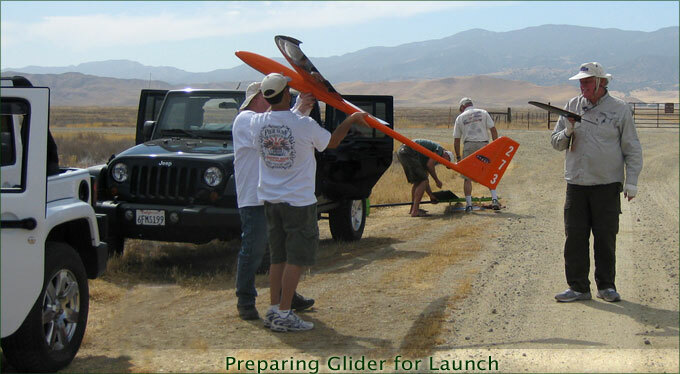 Our plan was to launch from the south end of the Valley in the late morning, fly north to the California Valley Lodge, and then return to the launch point for a total distance of approximately 56 kilometers (35 miles). The wind typically blows from north to south and increases in intensity by early afternoon, so we hoped to take advantage of it on our return leg of the flight. For my flight, I had Rick Shelby and my wife Marquita act as the official observers. Dean enlisted Roger Hebner and Jeff Jarvis as his observers. Ron McElliot was acting as the directing official for both of us. We met at the launch site at about 11:00am. The wind was light, and the temperature was about 90 degrees F. The sky was mostly clear with only a few high clouds. The weather looked ideal for the record attempt. We assembled the winch for launching and carefully measured the line distance to make sure it was no more then the required 300 meters. The two gliders were assembled. We were both flying the MXC glider. 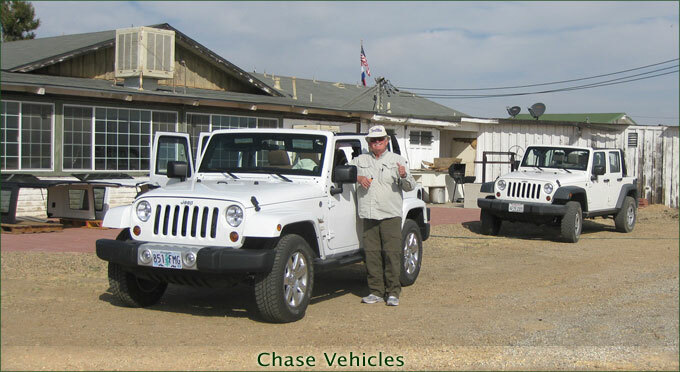 The MXC is a kit manufactured by RnR products of Milpitas, California. 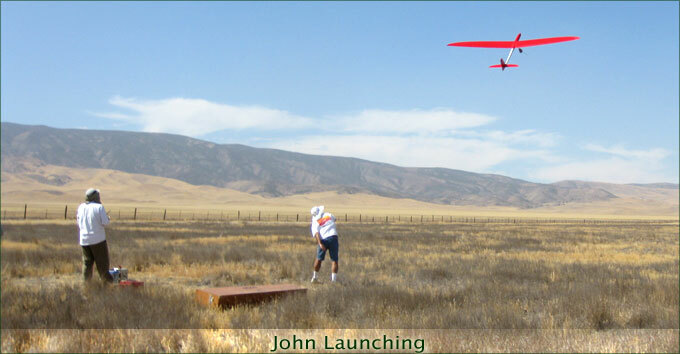 It is an all composite molded kit made specifically for Cross Country Soaring. It was about 11:45 am when Dean launched then I launched shortly after. Dean found a thermal right away and seemed to be climbing quickly. After a quick search I found a somewhat weak thermal but was able to steadily climb. I could see that Dean was climbing rapidly and after only a few minutes he was out on course. Finally, after reaching an altitude of 700 meters (2,300 feet) above ground level (agl), we decided to get going and try to catch up to Dean. We carefully made our way north. We had plenty of time to complete the task, so it was more import to maintain altitude rather than worry about our speed. At first, the thermals were not real strong and topping out at about 750 meters agl. Gradually the thermals improved in both intensity and altitude. As we cruised north, we hit our first thermal on course after about 4 miles. It was somewhat weak, averaging only about 350 feet per minute climb rate and topping out at 750 meters. For the next 3 miles we flew through sink and arrived at the southern tip of Soda Lake with only 300 meters (985 feet) of altitude. Here we struggled for about 10 minutes with little bits of lift, until finally a half decent 300 feet per minute (fpm) thermal broke lose and took us to about 600 meters (2,000 feet). Once again we headed north and covered another 3 or 4 miles while steadily losing altitude. At this point, we could see Dean had found a thermal north-east of us over the hills. By the time we got to him we were down to 275 meters (900 feet) agl, the low point of our flight. We found the thermal, but again it was weak. We were able to climb to only 400 meters (1,300feet), before the wind pushed the glider too far to the east of the road over the hills. We had to break-off from the thermal before we lost sight of the glider. Flying west to bring the glider back over the road, the air seemed to be getting better. After only a mile or so, we hit a nice thermal in which we climbed to 950 meters (3,100 feet). For the next 6 miles we cruised at about 30-35 miles per hour between 900 and 1100 meters agl. By the time we got to the turnpoint, we had finally caught up with Dean. We rounded the turnpoint at 800 meters (2,600 feet) agl and headed back south with a nice 5 mph tailwind. What a difference it makes flying with the wind instead of against it! Now each time we stopped to thermal we were still covering distance as the wind pushed us closer to our goal. Arriving at the North end of the Soda Lake, we found a real boomer of a thermal. 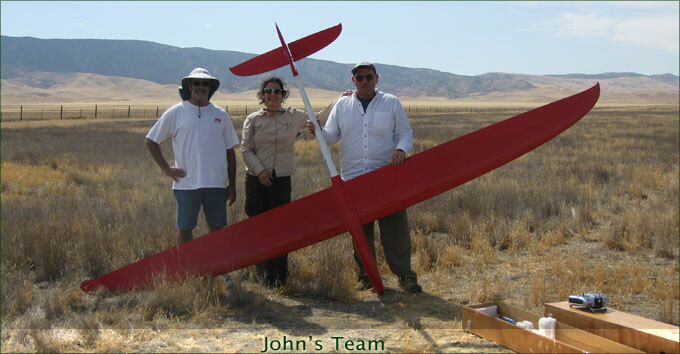 Lift rates exceeded 1000 fpm as we found our glider at 1200 (4,000 feet aprx.) meters with only a few circles. I left the thermal but the lift continued as I pushed the nose down to try to keep the glider in sight. It was still climbing rapidly, even as I raced ahead. At this point, my biggest concern was maintaining sight of the glider. It was comforting to have Rick as my observer, as he was able keep the glider in sight. I even pulled full flaps for a time to try to get the glider down to a lower altitude without exceeding Vne (speed never to exceed). For the next 12 miles we flew due south, never circling, at a ground speed varying from 40 to 60 mph. I desperately tried to keep the glider from climbing as we sped along maintaining an altitude of about 1300 meters agl. Sometime earlier, we had passed Dean and were well ahead of him. Dean had run into some bad air and had gotten to below 50 meters and was looking for a good place to land. Fortunately, they found lift just in time and were able to thermal back up to the limit of visibility. We made it back to the launch point with plenty of altitude to spare. I flew the glider in circles while slowly losing altitude. At this point Dean’s glider made it back to the launch point, and he had to search out an area without lift in order to get the glider back on the ground. We both landed within 30 meters (100 feet) of the launch point, and we knew we had achieved our goal. The entire flight had taken just under 2-1/2 hours. Dean and his team were prepared for this moment, as they broke out bottles of bubbly to celebrate. Both Dean and I would like to thank the official FAI observers Rick Shelby, my wife Marquita, Roger Hebner, and Jeff Jarvis, along with Ron McElliot who acted as the Directing Official. 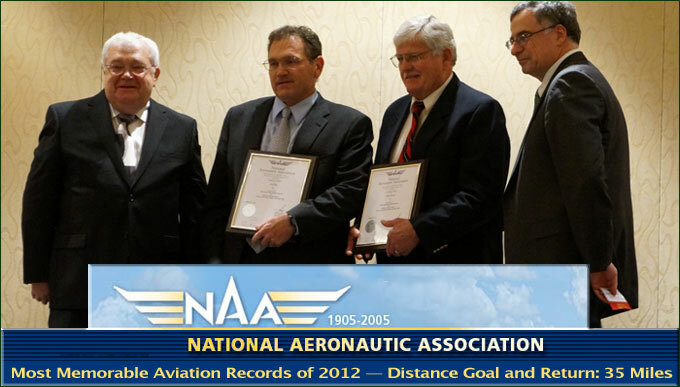 Without their help the record could not have been completed and would not have been ratified by the NAA or FAI.